If your organization uses the 2013 version of Microsoft Exchange Server to manage the distribution of email, you should also implement third party anti spam software for Exchange 2013. This is due to the way in which Microsoft updates its Exchange Server software (retrospectively) and the frequency with which spammers release new versions of spam email (multiple times daily). Consequently, Microsoft´s proprietary anti spam filters catch a relatively small percentage of spam – exposing organizations to the risk of phishing campaigns, spoofed emails and email-driven cyberattacks. The productivity loss to an organization handling hundreds of spam emails every day can cost tens of thousands of dollars every year, and being the victim of a cyberattack can cost a lot more. In 2015, the Ponemon Institute released a report entitled “The Cost of Phishing & Value of Employee Training”. Researchers compiling the report calculated that the average cost to an organization of removing malware and recovering data following a cyberattack was $1.8 million. The 2018 Cost of a Data Breach Report from the Ponemon Institute/IBM Security shows the cost of mitigating a data breach has risen substantially. The average cost of a breach of up to 100,000 records was determined to be $3.86 million. By comparison, the cost of implementing third party anti spam software for Exchange 2013 is typically less than $10.00 per employee per year. Third party anti spam software for Exchange 2013 works by running a series of tests on each inbound email and comparing their IP addresses to those that appear on global blacklists. Other tests result in each email being given a Spam Confidence Score based on its content, the quality of its attachments, and the IP reputation of the sender. Network administrators can adjust the software´s parameters to adjust the Acceptable Spam Threshold. Most anti spam software for Exchange 2013 allows administrators to apply different thresholds for different users or user groups, so that business-critical emails are not quarantined in error – for example, sales leads. The security mechanisms conducting the tests are updated in real time, and the tests are run in a sequence that prevents emails queuing up and delivery being delayed. Anti-virus software also checks each email for malware within its content or within an attachment, while SUBRL filters check for links to websites known to feature frequently in unsolicited emails. Third party anti spam software for Exchange 2013 also scans outbound emails. This is to check no outbound emails contain content that could be considered spam by an over-zealous inbound filter and reported to a global blacklist agency – the consequence of which could be the organization´s IP address is blacklisted. This is a feature absent from Microsoft´s proprietary anti spam filters, unless the organization pays extra for an Exchange Online Protection package. The significance of outbound scanning should not be underestimated. If an organization´s IP address is blacklisted after spam or malware has been identified by another user´s inbound email filter, it may not only affect the organization´s ability to send and receive emails. It could affect access to their website too and any other operation that involves the DNS server. For MSPs not subscribing to an Exchange Online Protection package or a third party anti spam software for Exchange 2013, the consequences can be devastating. If one of an MSP´s clients has their IP address blocked, and other clients of the MSP are sharing the same IP address, all the clients with the shared IP address will experience the same problems. Although it is not difficult to get an IP address unblocked, it can be time-consuming. If the clients of an MSP are without email services and web access for (say) seven days, it will likely result in a loss of credibility and a loss of custom. For this reason alone, MSPs should certainly investigate third party anti spam software for Exchange 2013. In order to compare anti spam software for Exchange 2013, it is best to start with Microsoft´s premium “Exchange Online Protection” (EOP) service. EOP replaced Microsoft´s “Forefront Protection for Exchange” when Exchange 2013 was launched, but unlike its predecessor has no on-premise hosting option. EOP has also been criticized for having a high maintenance overhead. Despite being 20-25% more expensive than third party anti spam software for Exchange 2013, EOP lacks several key security mechanisms – one being “greylisting”. Greylisting is one of the most effective tools in the detection of spam email. It works by returning emails to their originating servers and asking that the email is resent. Spammer´s servers usually ignore the request due to being too busy sending more spam, and the email is never returned. What is the spam capture rate? How is it verified? How many genuine emails are captured as spam? How are emails captured as spam managed and reported? Is there an email continuity service in the event of an outage? How is the anti spam software for Exchange 2013 deployed? Can the service provider supply independent testimonials from existing customers? There will likely be plenty more considerations to take into account depending on the size of your organization and the nature of its business. For example, organizations with limited IT resources may have concerns about the software´s ease of use, while Managed Service Providers may require APIs to integrate the software with other management tools and a white label option. 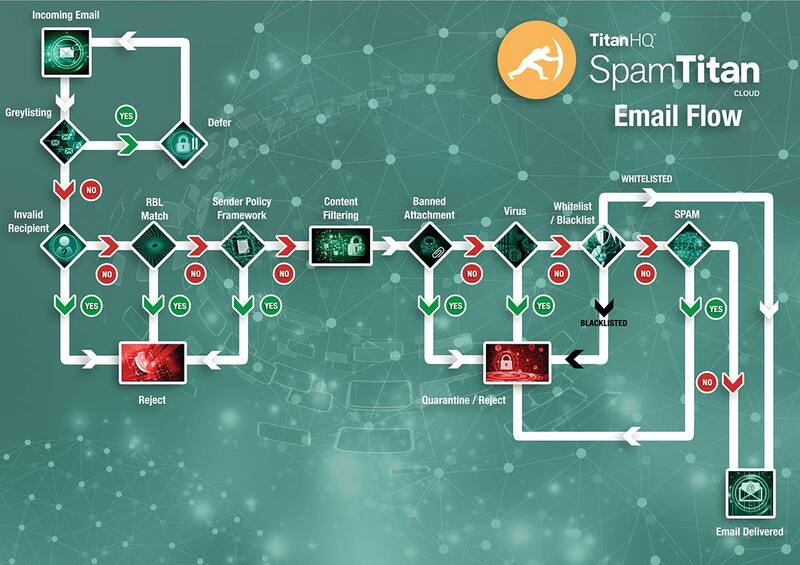 SpamTitan Gateway and SpamTitan Cloud are two powerful anti spam filters that equip network administrators with the tools they need to reduce spam and increase protection against malware. Both anti spam filters block 99.97% of spam – according to the leading independent testing and certification body VB Bulletin – and identify just 0.03% of genuine emails as spam (“false positives”). Network administrators have a choice of what settings are applied to optimize the performance of the anti spam software for Exchange 2013 and how emails captured as spam are managed (quarantined, tagged or deleted). A series of customizable reports help identify false positives or outbound emails identified as spam, and also malware threats identified by dual Bitdefender and Clam anti-virus software. An email continuity service is provided by both anti spam filters. Both have a low maintenance overhead and both have a comprehensive selection of APIs available to integrate the anti spam software for Exchange 2013 with directory and management software. The primary difference between the two anti spam filters is how they are deployed. SpamTitan Gateway is deployed as a virtual appliance. This means it is on-premise anti spam software for Exchange 2013 that is installed between an organization´s firewall and its mail server (an option no longer supported by Microsoft Exchange). By comparison SpamTitan Cloud is hosted in the cloud – either in SpamTitan´s Cloud, in a dedicated Private Cloud, or in a cloud within the organization´s existing infrastructure. SpamTitan has developed online security solutions for more than 5,000 customers since 1999. We are happy to guide organizations to independent reviews websites, where there are many testimonials about the effectiveness of our products. However, we believe that the best way to evaluate our anti spam software for Exchange 2013 is in an organization´s own environment. Consequently we are offering all organizations and Managed Service Providers the opportunity to try SpamTitan´s fully-enabled cloud-based anti-spam service for free. Our offer includes full customer and technical support and does not require any commitment to continue with our service once the thirty day trial period has expired. To take advantage of this offer, simply call our team of sales engineers. One of our friendly and experienced team will answer any questions you have about anti spam software for Exchange 2013, and guide you through the installation and configuration process for the most suitable of SpamTitan´s anti spam filters. Spammers and cybercriminals make their money by exploiting individuals and organization who fail to protect themselves against email threats. Make sure your organization is protected against spam, phishing campaigns, spoofed emails and email-driven cyberattacks by implementing anti spam software for Exchange 2013 today.